Recently, the Bureau of Industry and Security (BIS) proposed significant changes to industrial e-waste recycling, an initiative that has found support with the Coalition for American Electronics Recycling (CAER) and its members. 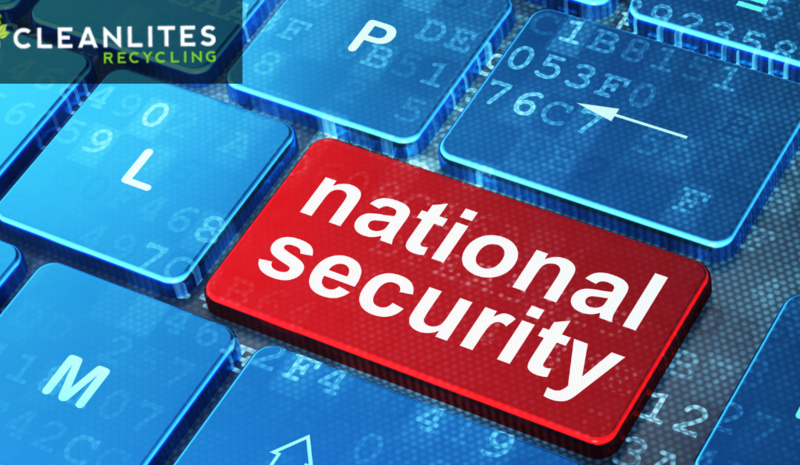 As a member of CAER, Cleanlites has always upheld a mandate to recycle securely, sustainably, and safely, and we are 100 percent behind any regulatory changes that would protect our national security and the American economy. National security and recycling: what’s the connection? While many wouldn’t think that “national security” and “recycling” could be grouped under one heading, the issue is coming to a head. E-waste is taken in by unscrupulous scrap dealers and brokers and then sold to organizations overseas (primarily China) for pennies a pound. It is then shipped in containers to the buyers as raw material, who strips the e-waste of microchips. The microchips are then painted, marked with counterfeit ID numbers, logos, and date codes, and installed into electronics of all kinds, which are bound for the military, industrial machinery, and for consumer goods. There are several concerns here. E-waste, essentially, is intellectual property that has been developed at great expense by companies here in America. When it finds its way into the hands of counterfeiters, it gives them access to our innovations, which can then be used to undermine our economy. Another concern is that counterfeit microchips provide a ready platform for cyber terrorists to launch attacks, which could pose a significant threat to both citizens and government. Additionally, when counterfeit parts find their way back into electronic equipment destined for the military, the healthcare sector, aviation, public transportation or any other high-stakes application, the risk of malfunction and failure can be deadly. According to the Semiconductor Industry Association, unscrupulous brokers have shipped counterfeit semiconductors and components for use in medical equipment such as defibrillators and intravenous drip machines, consumer goods such as vacuum cleaners, power supplies for aircraft landing lights, and braking systems in high-speed trains. Had these parts not been identified, the outcome could have been deadly. Since so many of these counterfeit chips are built from e-waste exported from the United States, it would stand to reason that the best way to combat this is to limit the amount of raw materials we are giving the counterfeiters to work with. By limiting exports of raw e-waste materials, we can stem the tide before it puts America at risk. These additional classifications will support the collection of data on e-waste export and give us a more accurate view of the volumes at issue. Of course, with any such measure, there are opponents; largely, these are organizations that profit from e-waste export themselves. As a CAER member, we are fully committed to ethical and sustainable recycling practices, and we support the proposed regulatory framework. If you would like to learn more about how Cleanlites can help with your e-waste recycling needs, reach out today.